Today, the focus of the lectionary is on young adults (ages 18 through 35 and 18 through 40 in some black churches). They are members of our community who are often misunderstood, underserved, and overlooked. Each year, many, because they have dropped out of school before they reach the budding age of seventeen, slide into adulthood through the broken doors of wounded family structures (single parenthood and poverty), joblessness, homelessness, and dead-end jobs. Others extend their adolescence by entering college or vocational training programs to prepare themselves so they later will be able to provide for themselves and support their families. Unfortunately, higher tuition and other increased school costs, fewer class offerings, and retrenchments in faculty and staff have increased the overall costs and prolonged the length of time required for completion of those educational ventures. There are still a few of our young adults who are able to find decent employment with health care benefits; but, in these times of recession, cut-backs and lay-offs, they, too, are perched on unstable ground. For these young adults, many just starting out in life, the current picture is not pretty. An even more difficult picture exists for many of our post college-age young adults (ages 24 through 35) who have started families, purchased homes and begun educating their children. Too many have fallen prey to the housing market’s foreclosure abyss, unemployment lines, or manufacturing plant closure syndromes. Pensions have been lost. Savings accounts have been wiped out. And, family health care costs continue to skyrocket. Historically, the black church has celebrated many segments of the Church. Children and youth are celebrated. Men and women have their days. Mothers and fathers are also celebrated. Usher and music departments are singled out for special recognition; and, the works of pastors and mission workers are commemorated. Thus, it is only fitting that the black Church pauses to celebrate young adults. It is a distinct group in the Church, with its own and unique issues. Each liturgical moment on the black Church calendar embodies its own importance, is intended to highlight a special or worthy event or group, and is usually informed by a chosen scripture. Young Adult Sunday meets these criteria. We also are exposed to lessons of: readiness, courage, strength, obedience, and servanthood. This is juxtaposed with lessons about God’s faithfulness and God’s willingness to stand beside each new generation of leaders. Here, we find the fulfillment of a covenant promise that is intertwined with the courage and strength of a new, younger servant leader. As the black Church reaches for actualization and fulfillment of God’s promises to it, there is a constant need for it to expose, train, equip, prepare and install new, young leaders, male and female, to carry out the current and future work of God. Even more important, however, is the Church’s obligation, if it too is to be a servant Church, to receive and advance those (males and females) that God calls to the ranks of leadership, regardless of their young age or gender. During our African-American wilderness experience in this country—from slavery to our present second class citizenship—God has made numerous promises to the people of God. Many of those promises have been enshrined in our music, poetry, and prayers. Others have been immortalized in our art, dance and worship. Still others have come through our prophets, teachers and leaders—from our Middle Passage griots to our Civil Rights champions and present leaders. And, others have come through the grief, suffering, and hope of our ancestors. Then, there is the experience of our wilderness wandering. Young Adult Sunday provides the black church with an opportunity to plan a day that can be linked to the Church’s daily mission of celebrating, advancing, receiving, preparing, training, exposing and elevating the young adults of our congregations and communities. It is a day that calls the church to the task of removing all human-made obstacles that stand in the way of these young people. And, it is a day that the Church can use to highlight new and emerging young adult leaders—from the front door to the pulpit. It is a day of affirmation of new leadership. It is a day where the courage and strength of the new leadership and that of the congregation can be displayed. 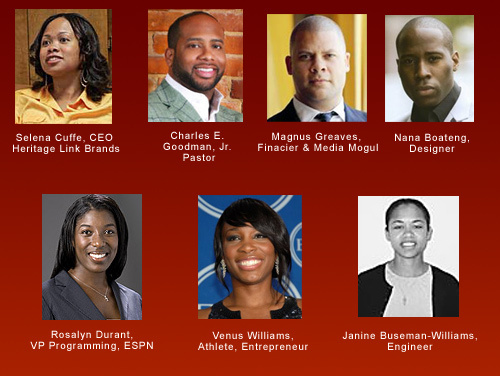 Every year since 1989, Ebony Magazine, founded in 1945, has published a list acknowledging and celebrating some of the most promising “Young [African American] Leaders of the Future.”4The list always includes a number of highly educated, high achieving young black men and women with connections to business, education, industry, government and the non-profit world. While the list is laudable and the highlighted individuals are worthy of recognition, the list does not tell the entire story. There is another story about young adult African Americans that should be acknowledged and addressed by the black Church. That story is not laudable. That story is not filled with promise. That story does not deserve to be immortalized. Yet, that story is worthy of the black Church’s attention. Through that attention, that story can be altered and the lives of many young adults can be redeemed, if the black Church is willing to embrace the problems presented by that story; and, if it is willing to offer and implement practical solutions. Using the barometer of employment and the prism of unemployment we will explore that other story and the general state of affairs of too many African American young adults. Economists and other professionals who are adept at explaining and forecasting labor trends mostly agree that the current recession is one of the deepest recessions Americans have faced since the Great Depression. They also indicate that, while there are signs that the current recession is about over, it may take years for the country to bounce back from the harsh effects of this economic meltdown. Some jobs will not be replaced. Some industries that have shuttered their doors will not return, especially some industries in the manufacturing arena. And, many of the replacement jobs will be low-paying with limited benefits, especially in the service industries. the government began keeping track. Black young adults are under siege. The right to work is a fundamental right. When that right is lost, whether through discrimination or through normal ebbs and tides of the nation’s economic system, it creates long-lasting havoc in the lives and futures of the affected citizens. With no job or basic income, one quickly falls to the bottom of the heap since there are few government or private safety nets. Children suffer, homes are lost, families are torn apart and neighborhoods decline—primarily due to the disappearance of work. The black Church can play a major role in helping to remedy this situation. It has more than a bully pulpit. In the past, the black Church has had a major hand in resolving every significant civic, educational, financial and social issue faced by the black community. It has resources, including cultural, financial, and human resources to invest in remedial efforts. In addition to celebrating its young adults on Young Adult Sunday, it can work with new and emerging leaders to fashion strategies, plans and pathways to help our young adults emerge from their wilderness of unemployment and cross back into the land of promise. The country’s two wars in Iraq and Afghanistan are taking a toll on enlisted military personnel—most having to submit to extended and repeat stays in combat zones; and, many experiencing post traumatic stress symptoms and having to operate with brain injuries once they return home. When they complete their assignments, veterans, even with their hiring preferences, often face significant challenges in trying to find a job. unemployment is up over 15 percent. When young adult African American veterans return to their congregations and communities, these are the problems they are bringing with them. Having bravely and honorably served their country, their congregations and communities should be prepared to embrace them and help them with their re-entry into civilian life. They, too, should be celebrated on Young Adult Sunday. Many of these veterans will need assistance in restarting their lives, recapturing their dreams and redefining their purpose in life. Recent news reports indicate that they are not being assisted with these tasks to the extent they should be assisted. Their courage and strength, as in the case of Joshua, already will have been tested. They are already know God chooses new leaders and stand by them, because of their personal experiences in combat. They now need to know their congregations, communities, and country will stand by them and provide them with the support they need to continue their growth. Here, there still appears to be an open question. It was not always that way. When I was seventeen, approaching graduation from high school and my impending 18th birthday that would come at summer’s end, my classmates and I spent untold hours dreaming and bragging about the cars we would buy and the houses we would build after we got our first job. Many of us also talked about the college we would attend and the profession we would pursue. Although we attended a segregated high school, lived in a poor, segregated state (Mississippi) and would probably attend an under-funded, segregated college, we were sure we would succeed—we would finish school, find jobs, buy cars, build homes and, for those who wanted, start families. That was 1965, the same year American combat troops were first sent to Vietnam. Strangely, even though America’s combat involvement in the Vietnam war lasted through the early to mid-1970s, no member of my high school class, to my knowledge, died until relatively recently. Even more interesting is the fact that the vast majority of those of us who graduated that year all achieved our modest goals—quite a few went even further to become doctors, lawyers, school principals and superintendents, politicians, teachers, pastors, college administrators and educators, and role models for our brothers, sisters and members of our local community. I don’t believe we were unique. In spite of the urban unrest of the 1960s, the untold carnage of the Vietnam War, and the broken promises of national and local politicians, stories similar to ours were played out in many communities in black America--even for those who didn’t go to college. Many of our comrades at home and across the nation went straight from high school to work in skilled and unskilled labor positions—in factories, post offices, corporate offices, banks, car manufacturing plants, government offices, transportation agencies, etc. They, too, in most instances, were able to realize their dreams, including building houses, buying cars, providing for their families, and educating their children. Of course, there were those across the country who didn’t return from the war, or who came back with problems similar to the ones that vets of today are exhibiting. Still, many of us became leaders in our communities and churches. We registered and voted. We volunteered our time in untold hours and created and supported philanthropic endeavors on both the local and national levels. We gave and continue to give back to our communities, including to the communities that nurtured us as children and young adults—to churches, civic organizations, church family life centers, tutorial programs, recreation centers, scholarship programs, schools and colleges, senior citizen programs, and to programs aimed at enhancing opportunities for young adults. We became the recipients and protectors of the fruits of Dr. Martin Luther King, Jr.’s dream, our parents’ hard work and savings, and our ancestors’ courage and strength. As young adults, we were nurtured by home, school and church. We gained access to pieces of the American dream and the American pie—not always big or fair pieces—theretofore not shared with many black Americans. We progressed. We prospered. My home church did not have a young adult Sunday on its liturgical calendar. There were no special days for congregants between the ages of 18 and 35, and there was no special choir or other special ministries for people that age. Instead, the leaders and elders of the Church poured themselves into each of us—at church and in the broader community. 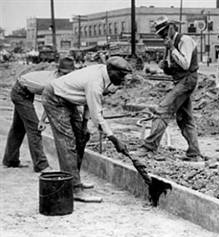 They trained us in the ways of white folk, how to survive in the belly of Mississippi apartheid, and what to expect when we encountered whites on the job and in other places. They did not teach us hate. They taught us love. They taught us survival techniques. Our little Church was one of the many black churches that was fire-bombed during the height of the Civil Rights Movement of the 1960s. Daily, our elders, in the face of extreme discrimination, hatred and violence, reinforced a set of core values through direct teachings and adult examples that has served us well. Although my little church (the Holy Ghost Missionary Baptist Church of Clinton, Mississippi) had no college scholarship endowment and no formal scholarship program, every graduate, including every Head Start, eighth grade, high school and college graduate, each year received a public recognition and a monetary gift from the special offerings that were taken up for those purposes. Moreover, individual members would still push dollar bills and other gifts into the hands and pockets of the student achievers. In addition, words of encouragement and praise were constantly bestowed upon us. We were not only encouraged to achieve and to take leadership positions in the church, we were expected and required to do so. Opportunities to serve included the youth and young adult usher board, Baptist Training Union, Junior Choir, Sunday school, Fifth Sunday Mission activities, vacation Bible school, and Girl and Boy Scouts. Often, we represented our church at other churches, acted in and presented plays, recited poems, participated weekly in regular church programs, went on trips sponsored by the Church, and were mentored by senior adult leaders of our Church. And, yes, we served in church leadership positions. All of that made a big difference in our lives. That was the old-fashioned way of celebrating and supporting young adults. That was the old fashioned way of accepting, receiving, and preparing new leadership for God’s vineyard. That was the old fashion way of developing courage and strength in young adults. Today, to reach the young adult population, churches must be willing to experiment, trust the leadership of the young and remove barriers, visible and invisible, that discourage the 18 to 35 age group from participating in church activities and from emerging as new leaders of the Church and community. Ageism and sexism are two of the main barriers that reside in most African American congregations. Some elders are not only reluctant to release positions of leadership to young adults, they are reluctant to do things differently from the way they have always done them. Other elders seem to think young adults are not experienced enough to lead; and, still others simply covet and hold on to leadership positions because of the associated powers. These attitudes discourage the young. They retard the growth of new leadership, and they withhold the benefits young people have to offer the broader Church body. The other barrier—sexism—is more like a deadly cancer in the Church than a mere barrier. Since its founding, the Church has relegated women, especially women preachers, to second-class citizenships status. 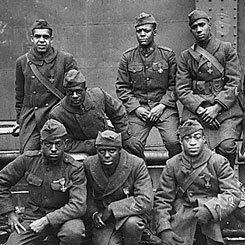 It defies human logic and spiritual maturity to think that young adult women can serve as chaplains and religious leaders on battlefields, but not preachers or pastors in most African American churches when they return from war. Each of these barriers sends very negative messages to the young and to the female members of church congregations. Young Adult Sunday provides each congregation with an opportunity to dispense with these barriers and to become more affirming bodies of Christ. Cultures can be changed. When cultures change, benefits flow—our lection scripture for today shows us that. Hard times call for creative solutions. More than a third of our young adults are unemployed, and many of them may not be able to find decent employment anytime in the distant future. Another segment of African American young adults is not only unemployed due to the current recession, many have returned from war zones with serious physical and mental wounds. If they don’t get help, and get help soon, they can become permanently unemployable. Many of these people have children to rear and families to maintain. Then there are those who have been incarcerated who want to work but with criminal records and few work skills cannot. Perhaps the most intransigent group of young adults to reach are those who addicted to drugs and the thug life; they are ravishing their bodies, families and communities. These are really hard times. Now is the time for black churches to combine and harness their resources in creative ways to help solve these problems. In times past, it was done to build and maintain black schools and colleges. It was also done to help start black financial, health and insurance institutions. It was done to help fund the start of black funeral homes, seminaries and other institutions. Why can’t it be done now? It can be done and much of it can be done by young adults. The same creativity and ingenuity that were used in the past to build black communities can be used now to put thousands of black young adults back to work. In the past, even the cultural resources of the race were used to build community. For example, choirs traveled all over the world raising money to aid colleges and schools. We still have the capacity to do that—just one way of putting young people back to work. A second way is to use and pay our own people to clean and maintain our churches, family life centers, church schools, and other facilities. There are thousands of black churches and all of them have facility maintenance needs. If resources were pooled, expenses could be lowered and young people could be trained and used for this work. The skills they learn in that black church experiment could then be transferred to the private sector. In fact, they could be helped to open their own facility maintenance businesses, hiring other young, black adults and veterans. A third option is for black church, business, fraternal, educational, civic and professional organizations, for a five-to-ten year period, to refrain from holding their annual conventions and meetings at large hotels that only minimally benefit our people. Instead, those conventions and meetings could be held on black college campuses. They could be held when the colleges are on break or in recess. The colleges would benefit, our young people would benefit, and costs most likely would be lowered. Finally, a fourth potential resource to explore (as a means of aiding our young adults) is the recording resource that many black churches, especially large churches, have. With proper planning and cooperative strategies, some of those resources, all across the country, could be used as recording studios for CD and DVD production purposes. Many young people already have those skills and could be put to work learning production, marketing, recording, etc. The goal would be to turn those resources into major production facilities that benefit portions of the black community that are larger than the local church. These are hard times. They require unusual, creative solutions. We owe it to our young adults to help find those solutions to blunt the effects of the current economic crisis. highly publicize all of these efforts and make clear that persons can dress down for the worship service. - and that's the reason - I'm Souled Out! Kiki: What is it you think you see? Our young adults are our present and future. If they are crippled and hobbled in the prime of their young lives because: they were not prepared for the ups and downs of life; were not schooled in the ways of success; or, were unable to find decent employment that will allow them to advance through life, we too have failed. We must find ways to prepare them for new leadership roles. We must create opportunities to insure their success. We must remove barriers that telegraph our doubts about their leadership potential; and, we most move out of the way, so they can exercise the calling God has given them. Begin with your Young Adult Sunday celebration. 1. Meeks, Wayne A., and Jouette M. Bassler. The HarperCollins Study Bible: New Revised Standard Version, with the Apocryphal/Deuterocanonical Books. New York, NY: HarperCollins, 1993. p. 326. 3. Shakur, Tupac and Bruce Hornsby. “Changes.” Changes. Santa Monica, CA: Interscope Records, 1995. 6. Ibid., p. 2 of 5. 9. Ratner, Lizzy. “Generation Recession.” p. 2 of 5. 10. Ahrens, Frank. “Unemployment Among Young Veterans Much Higher Than the National Average.” The Washington Post. Online location: http://voices.washingtonpost.com/economy-watch/2009/11/today_im_going_to_take.html p.1 of 4. 11. Ibid., pp.1-2 of 4. 12. Walker, Hezekiah, Shawn McLemore, Ricardo Sanchez, Marvin Sapp, and DJ Rogers. “Souled Out.” Souled Out. New York, NY: Verity, 2008. 13. Mary Mary with Kiki Shears. “The God in Me.” Mary, Mary: The Sound. New York, NY: Sony, 2008. 14. Carr, Kurt and the Curt Carr Singers. “Peace and Favor Rest on Us.” Just the Beginning: Live. New York, NY: Verity, 2008.